MAB Snack ‘N’ Learns Are Coming to YOU! 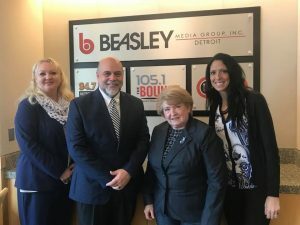 From left to right: MAB Government Affairs Director Elena Palombo, Beasley Media Group VP/Market Manager Mac Edwards, MAB President/CEO Karole L. White and MAB Director of Education and Development Jacquelen Timm. The MAB Staff is out and about sharing about the virtues of association membership with MAB members and their employees. Several stations have already hosted the MAB in 2018 and we are now booking Snack ‘N’ Learns for the for the second week in March. Staff members at Beasley Media Group in Detroit are ready to Snack ‘N’ Learn with the MAB. 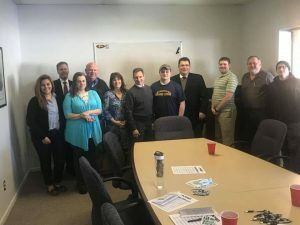 Staff members at Midwest Communications in Lansing gather to Snack ‘N’ Learn with the MAB. 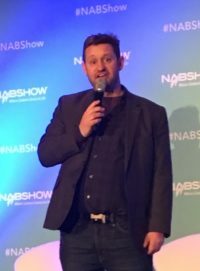 White said the MAB plans to host as many as to two Snack ‘N’ Learns a day, going on the road two or three days a week following the Great Lakes Media Show. We hope to visit every station or station group by years end. Contact Jacquelen Timm at 1-800-YOUR-MAB to book your station’s Snack’N’ Learn. Graham Media Group’s WDIV-TV (Detroit) has announced the launch of their second podcast series “Shattered: Black Friday.” This 10-part series investigates the 2010 disappearance of three brothers from Morenci, Mich. Alexander, Andrew and Tanner Skelton’s father claimed that he gave the children to an underground organization. Seven years have passed and their mother, Tanya Skelton, is still without answers. 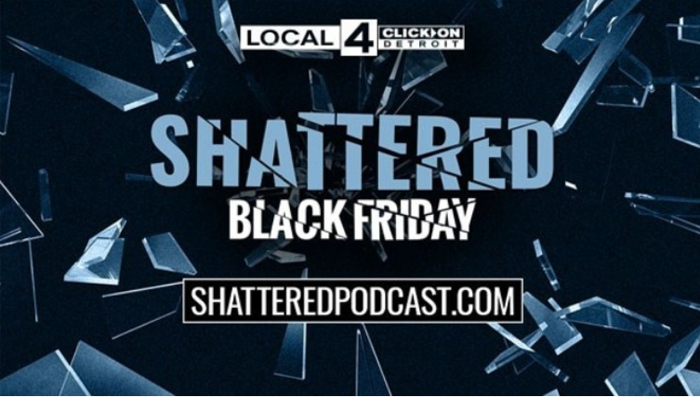 “Shattered: Black Friday” is produced and hosted by Jeremy Allen and executive produced by Ro Coppola. Black Friday refers to the popular shopping day after Thanksgiving, which was the same day the boys went missing. The boys’ mother told Morenci police that her husband, John Skelton, was supposed to bring the children back to her. But he never did. “We asked ourselves what stories have we covered in-depth that still haunt us. The Skelton brothers’ disappearance was at the top of everyone’s list. It was heartbreaking then. It’s heartbreaking now,” said News Director Kim Voet. Recently, this missing persons case made headlines on the other side of the country when human and animal bones were found in Montana. The bones were examined and found to be those of three young children. The first two episodes of “Shattered: Black Friday” was released on Sunday, February 4 with new episodes released every Friday. 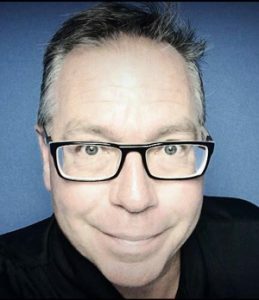 In December, Graham Media Group announced a podcast division and released “Mismatch,” a podcast series hosted by celebrated journalist Roger Weber which features stories about the incompatible. For more information and updates, follow Shattered Podcast on Facebook and Twitter. Listen to the trailer and new episodes at ShatteredPodcast.com. WCMU Public Media is partnering with Art Reach of Mid-Michigan’s Kids & Culture free event from noon to 10 a.m. on Saturday, February 17, for a variety of activities such as bracelet making, coloring, etc. The event will be held at the WCMU studios in Mt. Pleasant. “Pinkalicious and Peterrific” will premiere its on-air broadcast on WCMU on Monday, Feb. 19. 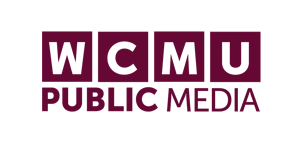 Check out WDET’s webpage on “How to Keep WDET and Your Other Favorite News Sources in Your Facebook News Feed” here. 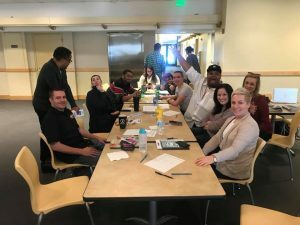 In a recent meeting between the MAB and members of Michigan Army National Guard , it was reported that recruiting inquiries have increased since the the Guard Bureau in Washington D.C. returned to NCSA. The Michigan Army National Guard asks people how they heard about the opportunities in the Guard and many have identified radio and or television (or both) as their source of information. Rick Teeter, marketing and advertising specialist at Michigan Army National Guard, said that he knows how precious our member’s airtime is, and the Michigan National Guard truly appreciates all of the emphasis that MAB members are giving to their messages. MAB members understand the importance of a strong Michigan National Guard. Citizen soldiers are there to help in time of crisis here and abroad. Airing the recruitment messages is one thing broadcasters can do to help and to say thank you to the men and women who leave their families to help us in times of need. Click here to learn more about this important partnership and download messages. 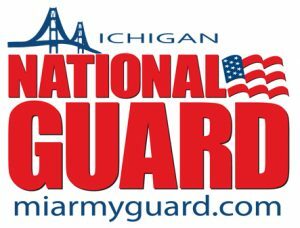 Contact Denise Weston at 1-800-YOUR-MAB if you have questions or would like to book an interview the a Michigan National Guard representative. Anything you can do will help. WXYZ-TV (Detroit) will air the Michigan Humane Society’s annual “Valentine’s Telethon” on February 8, from 6 a.m. to midnight. Last year’s event raised $382,000 for local animals in need. For a seventh consecutive year the Telethon is sponsored by Purina. Alicia Smith, anchor for “7 Action News This Morning,” will host the broadcast. Smith will entertain viewers with stories of animal rescues, cruelty investigations, and redemption. She will reunite adoptive families with the MHS, and the broadcast will feature a live puppy playpen. Viewers will see segments during commercial breaks throughout the day. They can also watch the telethon’s live puppy cam at https://www.facebook.com/wxyzdetroit/. The Michigan Humane Society relies on the generosity of donors, not government funds. Its first telethon aired in 1996, making this its 22nd broadcast. The overwhelming majority of podcast listening happens on Apple devices. While it can fluctuate, podcast hosting companies will tell you that roughly two-thirds of all podcast consumption takes place on iOS devices. Android comes in a distant second place. So, why does Apple dominate the podcast medium? To understand that, we need to take a closer look at the process involved in listening to a podcast. This process is slightly different on the two operating systems. Apple used to include podcasts in a dedicated section of iTunes, its music management app. When it introduced iOS6 in 2012, it separated podcasts out into their own app, called Podcasts. When Apple introduced iOS8 in 2014, it made Podcasts a native app. That is, the Podcasts app came pre-installed on every iOS device; people no longer needed to download it from the App Store themselves. Find the podcast you want. 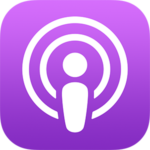 Find and download a “podcatcher” (an app for listening to podcasts). It’s just a couple of extra steps, but those steps have a huge impact on podcast listening. That’s why many people in the podcasting space, myself included, believe the top factor that would increase the number of people who listen to podcasts globally is not just the release of compelling content (like Serial), but rather a technological development; if Google embraced podcasts by including a native podcatcher on every phone, listenership would increase dramatically. 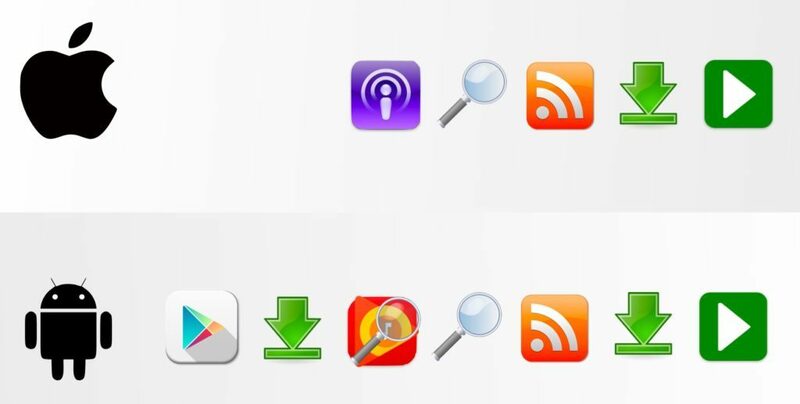 Google took a step in the right direction in 2015, when it started including podcasts in its Google Play Music app; but this really just brings Google up to where Apple was in 2013, when it still included podcasts in a section of iTunes. Of course, there are other technological developments that could drive more podcast listening. Spotify has embraced podcasts recently, and its app is installed on thousands of Android phones. Smart speakers, like the Amazon Echo and Google Home, could also contribute to an increase in podcast listening. So could dashboard operating systems like Apple CarPlay and Android Auto. Still, the development that most of us are waiting for is the native Android podcatcher. It may come any day now, or it may never arrive. We’ll just have to wait and see. For more assistance on digital or social media, contact MAB Member Services at [email protected] or 1-800-968-7622. Everyone, everywhere needs to prep. Executive Chef – Hockey Player – Florist. Check out what coach and educator Fred Miller says about that here. Sellers (and we all are): Sandler Institute’s Jody Williamson has pre-call tips for you here. We recommend that when prep services are up for renewal, drop them. Most of which are typically soaked with The Daily Horoscope, Today In History and The Impossible Question. With our ‘Three in Three’ prep exercise we teach, you quickly learn you don’t need them. Plus, when talent develops their own prep, there’s emotional equity. You literally can prep content in the time it takes to read this article. Audiences are engaged by the stories, topics that emotionally resonate and the theater of your show. Look to the Internet, a local paper or simply by obsere the world around you. Still think you need prep sheet? There’s plenty of free stuff out there. If you can’t find it here, you probably don’t need it. Just so you know: It took over 60 minutes to prep this article. Uncomfortable about cutting the prep sheet lifeline? Kevin Robinson will be speaking again this year at the Great Lakes Media Show (GLMS) March 6-7 here in Lansing. For details, click here. Kevin Robinson is a record-setting and award-winning programmer. His brands consistently perform in the Top Three of the target – often times as the list leader. In his 35 years of radio, he’s successfully programmed or consulted nearly every English language radio brand. Known largely as a trusted talent coach, he’s the only personality mentor who’s coached three different morning shows on three different stations in the same major market to the #1 position. His efforts have been recognized by Radio & Records, NAB’s Marconi, Radio Ink and he has coached CMA, ACM and Marconi winning talent. He lives in St. Louis with his wife of 30 years, Monica. Reach Kevin at (314) 882-2148 or [email protected]. In December, the FCC adopted a Notice of Proposed Rulemaking to review the national ownership cap for over-the-air television. The cap limits one owner from having attributable interests in television stations reaching more than 39 percent of the national audience. The date for initial comments is now set for February 26. The date for the reply comments is set for March 27. The NPRM asks two fundamental questions – does the FCC have the authority to amend the cap, and if does, should it use that authority to make changes now? According to the Broadcast Law Blog, March 1 is the deadline for all radio stations to convert to the online public file hosted by the Federal Communication Commission. For those radio stations that have not yet completed their conversion, February is the month to be uploading those documents. As the FCC automatically uploads most of the applications and other FCC filings that need to be in the public file, the documents that will likely take the most time for the broadcaster to upload are Quarterly Issues Programs Lists and Annual EEO Public File Reports, documents not filed with the FCC on a regular basis.